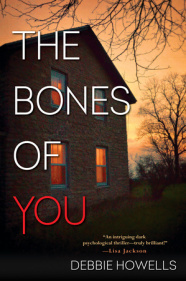 The Bones of You by Debbie Howells – Books, Books and More Books! After page 2, I turned off the phone and the computer. This is a complex and psychological story that is told from many points of view including Rosie, a murdered teenager. There are many monsters in this book and they all come wrapped in pretty packages. Who is lying and who isn’t? Child abuse continues long after you become an adult. It colors how you see the entire world. This book shows the worst of people and also the best of people. Rosie and her sister and even their mother, are so damaged on the inside that your heart bleeds for them, even as one of them commits an unspeakable act. I look forward to more from Debbie Howells!